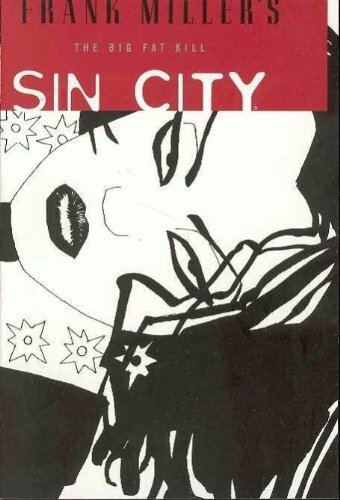 To be honest I find it hard to express how happy I am to be reading through Frank Miller’s Sin City books after being a fan of his work since I read Year One. Batman Year one was actually the first Graphic Novel I read and I’ve been hooked on comic crack ever since. After reading all of Miller’s Batman series I got more and more interested in what he did with characters and why he has been able to do things with comics that nobody else has. After reading the first three Sin City books I think I finally see how Miller has kept his audience so interested for so long. By putting so much adult themed material in a format that was originally based for the likes of Popeye and Mickey Mouse he opens up and almost shocks the imagination when it’s at its most creative state. Miller doesn’t just add adult themed scenarios but he wraps them into multi-layered characters which are hard to find in a lot of comics. But back to The Big Fat Kill. It follows Dwight who was Clive Owen’s character in the movie though the whole battle for Old Town, Sin City’s working ladies district. The area is called Old Town because Sin City was once a poor lifeless town till the original Roark family moved in and imported girls from all over the world to work the streets and attract rich tourists. The story mainly follows Dwight who was the main character in volume two A Dame to Kill For. His current girl friend gets in trouble with her ex, when Dwight warns him off he has to follow him to make sure there isn’t any trouble – but finds himself getting deeper into trouble throughout the night. Although I missed Marv from the previous two books you do get to know a few more characters like Gale and Meho. Also like the previous books you get to know the characters in a lot more detail than with just the movie. Overall it comes highly recommended as a total must read for any comic fan. The artwork is amazing and gives a whole new definition to the whole black and white print format. Like all of Frank Millers work you need an open mind his work, his work isn’t as black and white as a lot of comics. There are no good guys and bad guys, just people with problems and no good way to solve them.